Last year I was lucky enough to take a visit to the American Museum in Britain, based in Bath it is really one of the most beautiful settings I've ever come across. 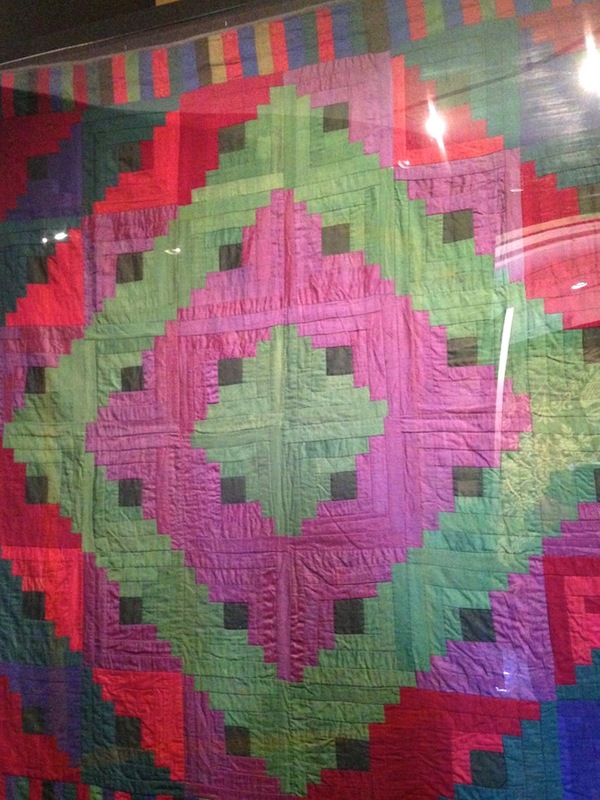 My prime motivation for going was to view the beautiful collection of antique quilts on display, of course. However the grounds at Claverton Manor with views over the Limpley Stoke Valley seriously rivalled any quilt display. We also had the perfect weather that day so it was a real treat to see it in all it's shining glory. 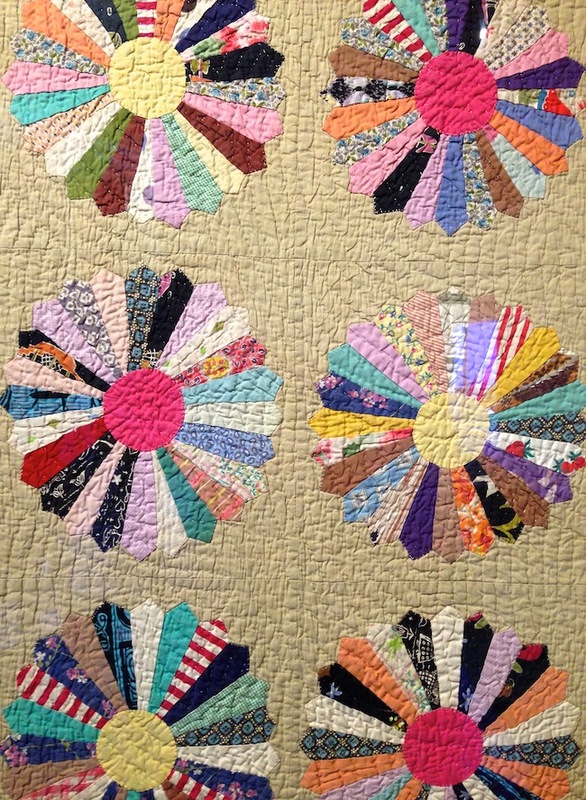 Though, I know you didn't click here to read about that … you wanted to see some quilting eye candy! I just thought I would share just a handful of my favourite's as I urge you all to visit the museum in person and see these beauties in real life to truly appreciate the workmanship. You can also purchase a book on the whole of the collection here. 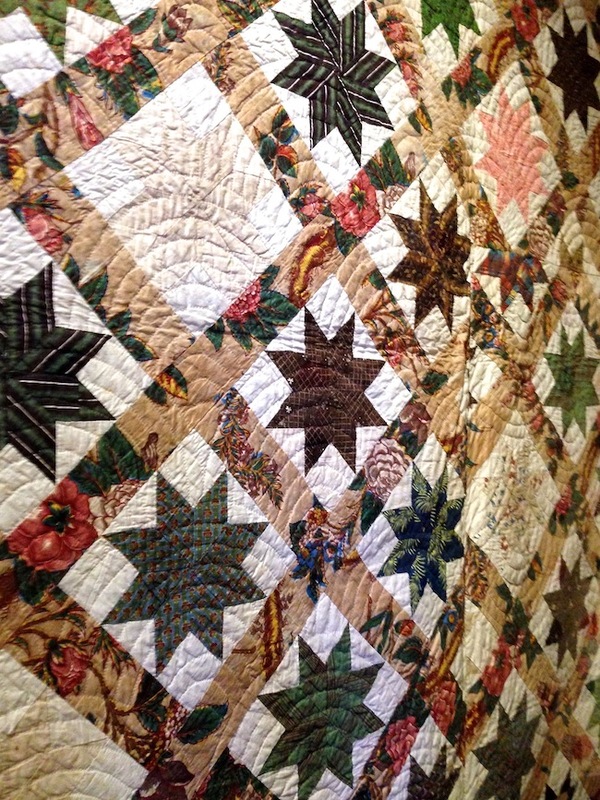 The museum has a collection of over 200 quilts with about 50 on rotating display to the public in the Textile Room. The quilts are displayed in a moving rack system, much like a poster display setup in shops. I remember it was like paging through a good book, eagerly awaiting the next chapter. Though this arrangement made it a little difficult to really 'see' the quilt's when there were lots of people gathering - all wanting to view different quilts at the same time. I would advise getting to the museum early and hitting the textile room first so you can avoid the crowds later on, then have a mooch about the museum, stopping for lunch in the Orangery cafe and walking the grounds in the afternoon. My photo's aren't great I'm afraid, they are all taken with my iPhone and it was rather tricky trying to get a clear shot through the glass reflections, while trying not to get in people's way. 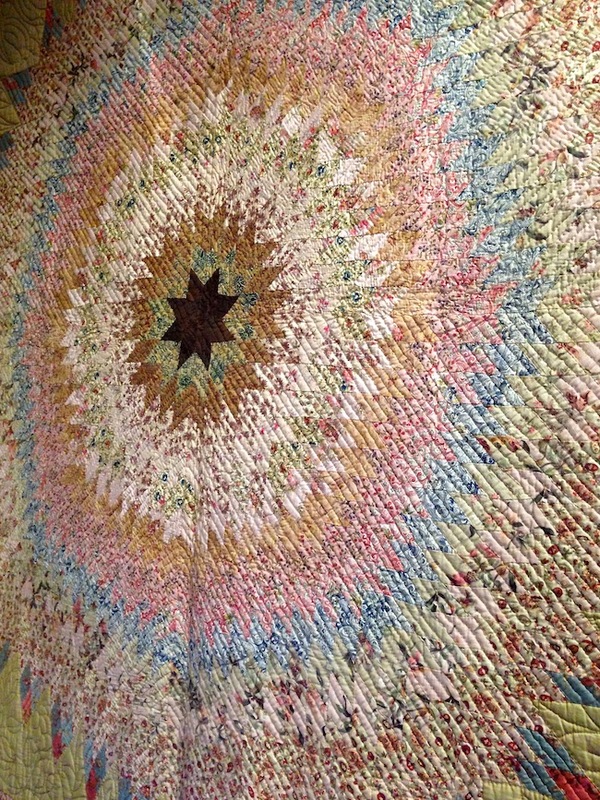 Firstly, I had to show my fellow English Paper Piecing lover's this absolutely stunning Hexagon and Star quilt. Isn't it just gorgeous, I remember admiring this for quite a while. It was pieced by hand using our favourite EPP method with silk fabrics. I love the deep colour's against the black, and the fussy-cut stripes used in the hexagons! The medallion effect from the centre creates a really striking look too. A simple 9-patch quilt, which reminded me I have one on my sewing-bucket list in order to use up my ever growing scrap pile! I love this pattern, it's so simple but effective and never seems to date. I'd love to drape this over my bed. I thought those cable quilted borders were something special too. 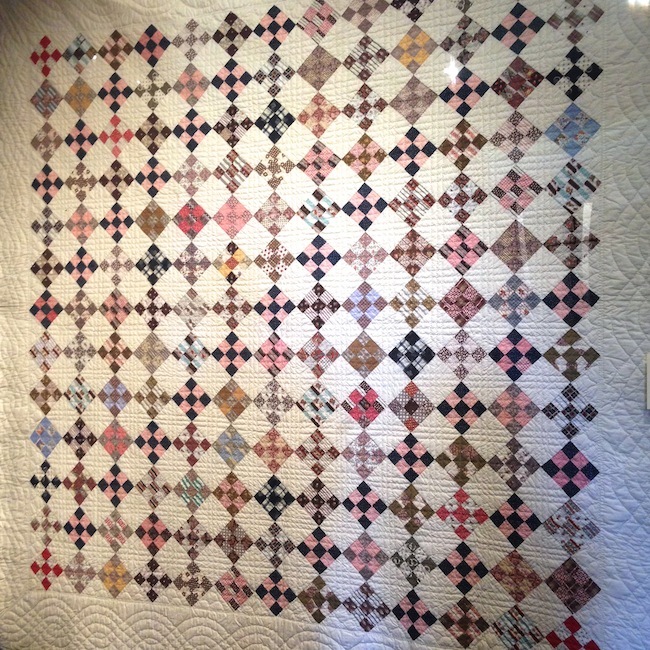 I adore Amish quilts, so I was really pleased to see one in real life finally, this is a Log Cabin quilt, used in a 'Barn Raising' design; where a diamond radiates from the centre. The jewel colours really set the tone for this quilt I think. 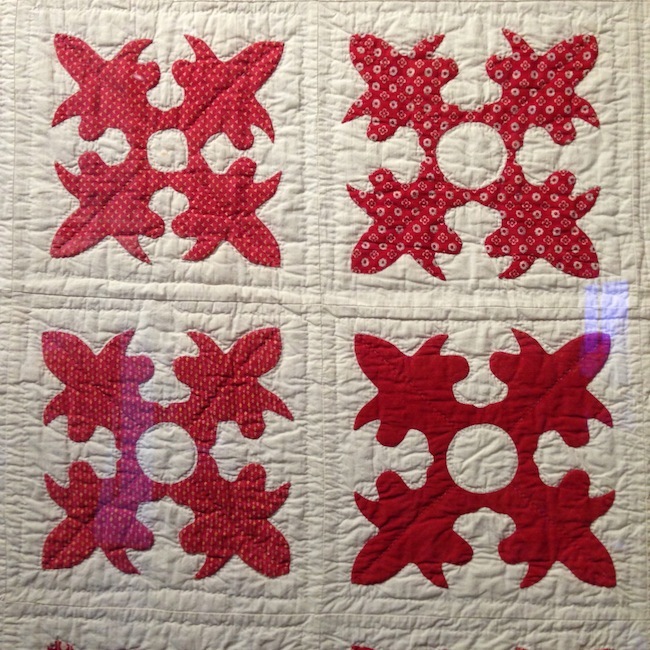 I never tire of seeing traditional red and white quilts, each one looks so different from the next and they always seem to pop up regularly on my quilting Pinterest board. This Pine Tree design was really beautiful, the hand quilting with scallops and wreath patterns was lovely to see in person, and left me full of motivation to hand quilt a full size quilt someday. 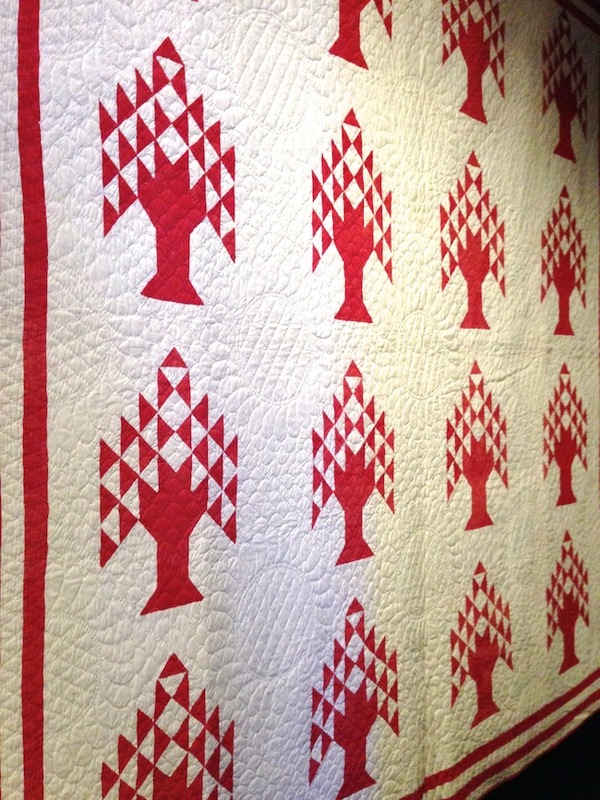 Apparently Pine Tree designs are often used in American quilting and embroidery because it symbolises the pine forests of New England (where I really want to visit someday!). Wow. This one really made a statement when I saw it, I definitely stood and admired this for some time. Another English paper pieced quilt, using an 8-pointed diamond - 3" size, perhaps? 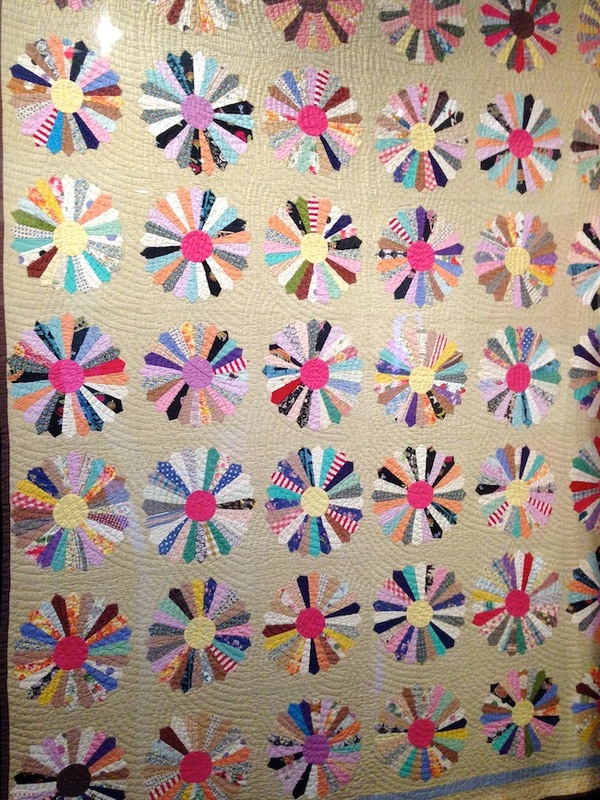 It was called the 'Sunburst Quilt', which is a very fitting name I think. 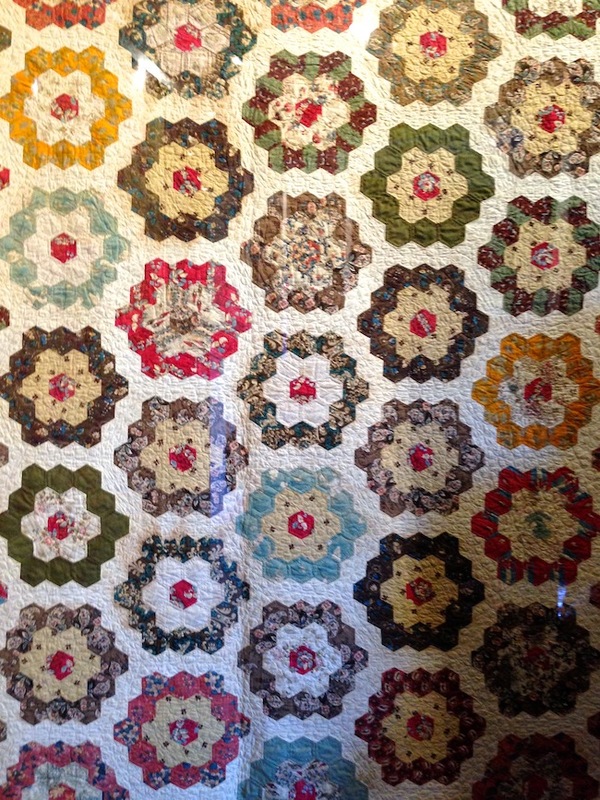 Now I don't think it would be complete collection if I didn't show you a Grandmother's Flower Garden quilt, now would it? It's made using very English chintzy fabrics from the 1820s, so it was quite a contrast from a lot of the other quilts on display. 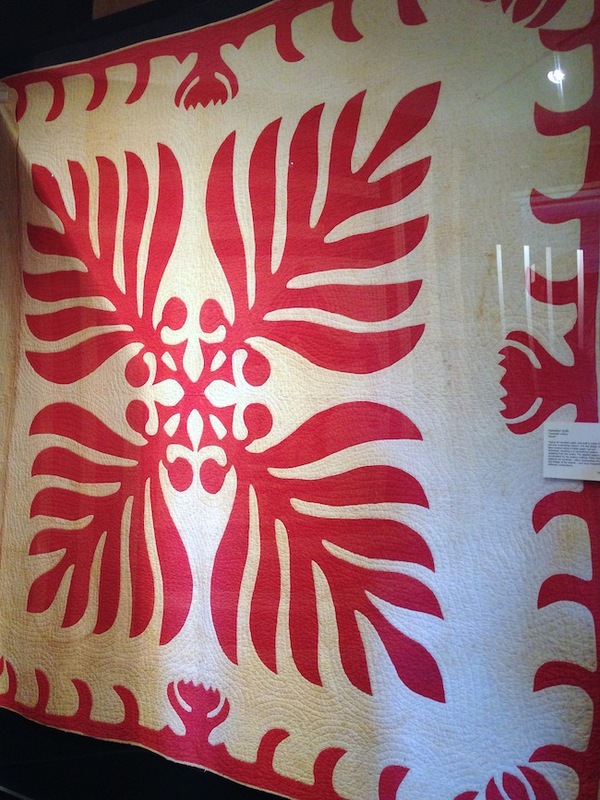 A beautiful Hawaiian quilt, very typical in design with a symmetric appliqué made in two contrasting colour's. I had to snap a photo of this as I'm currently working on a small wall hanging size Hawaiian style quilt in a sunny yellow and white colour-way, (I'll share some progress here another day). 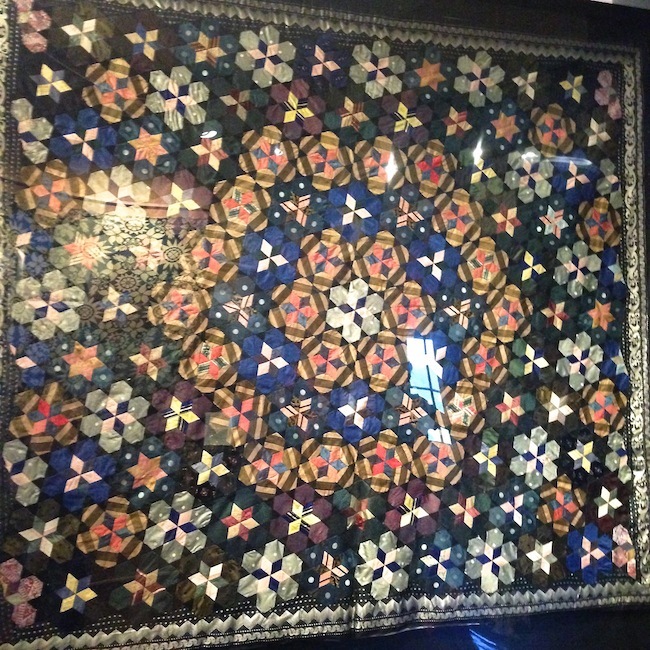 The echo hand quilting is really special and unique to these traditional quilts. I didn't share a photo of the Baltimore Album quilt that they have on display at the museum because it's really special and you have to see it in person. Over 10ft sq, it's a real show-stopper and I know lots of people travel to the museum to see that one piece. We just so happened to visit last year at the same time as the Kaffe Fassett exhibition, so I'll share that in a separate post soon! The museum has lots of other great things to see as well as the beautifully kept gardens, which is worth the visit alone. There are period rooms to explore and an interesting Native American section which we found fascinating. They are closed at the moment for building works and exhibition installation but re-opens for the year on the 14th March. You can find out more here. thank you for sharing the quilts. really enjoyed them as i probably won't get to see them in person. perhaps will purchase the book. thanks again. Thanks for sharing this post. I love going to Bath when in the UK! I will try to see this museum the next time I go. I had no idea that it was so beautiful. 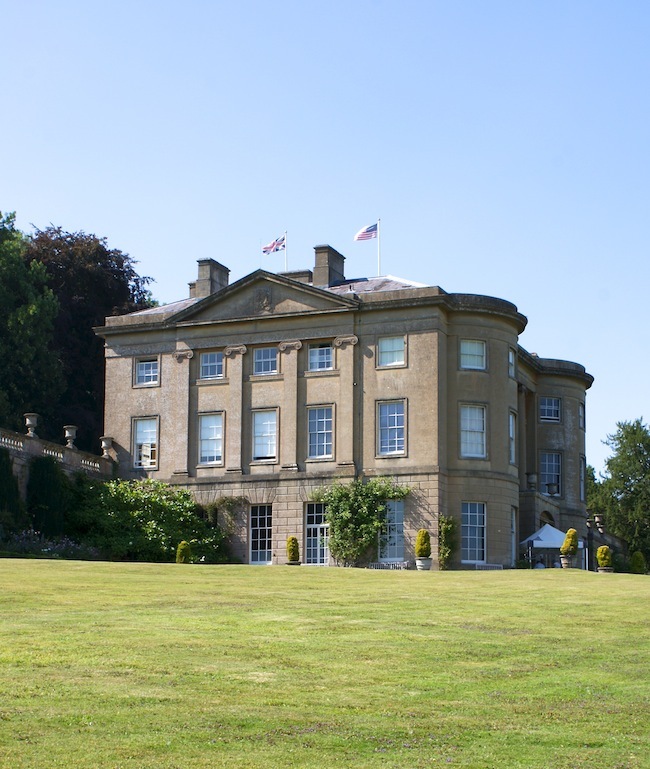 I love the grounds of Claverton Manor; I hope you had time to sit outside with your lunch, what a view! I have been several times; also to a textile fair in the Stables, lower in the grounds, very good. What a gorgeous display of quilts. They all look amazing. Thanks so much for sharing your favourites. The Dresden quilt looks like it could have been made yesterday! It is such a classic block, enjoying a recent revival I think! Thank you for sharing your travels to Bath. I had no idea there was an American museum there. How exciting it would be to come and see such a wonderful place. The grounds and gardens are just beautiful. What amazing quilts. I like the Dresden and the hexagon ones the best though. What an amazing place to display all of these works of stitchery art. You can enjoy the blankets then enjoy the grounds! Oh, these are so beautiful and inspiring! Thanks for sharing them.